CHICAGO – When I walked out of my screening for 2013’s “Romeo and Juliet” with Hailee Steinfeld (Oscar nominated for “True Grit”) and London’s Douglas Booth (previously unknown to the U.S.), I had to remember that not everyone’s seen this story in one way or another. So, I immediately polled four teenage girls. Batting away their butterflies and seeing through the hearts glossing over their eyes, they unanimously loved it, thought Booth was so very dreamy and went home with a new outlook on love – probably that love conquers all. For their modern-day version, they’d probably even give up texting for 12 whole days if it meant they couldn’t be with their boy crush. Hailee Steinfeld and Douglas Booth star in “Romeo and Juliet”. But back to my reality and like most other humans on planet Earth, I’ve seen this William Shakespeare tragedy told mostly the same way through nearly every artistic medium. Reminiscing to 1968’s “Romeo and Juliet” with Leonard Whiting (Romeo) and Olivia Hussey (Juliet) from director Franco Zeffirelli and 1996’s “Romeo + Juliet” with Leonardo DiCaprio (Romeo) and Claire Danes (Juliet) from director Baz Luhrmann, Steinfeld and Booth have a thing or three to learn from the fire felt between DiCaprio and Danes. 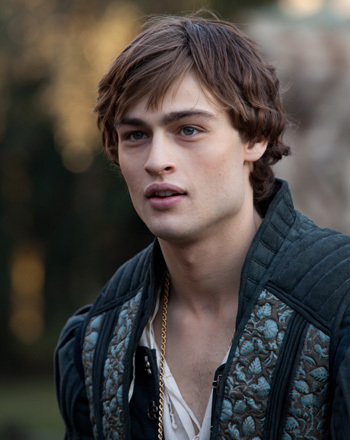 Douglas Booth stars in “Romeo and Juliet”. Boothfeld, as I’ll call 2013’s duo, feels like puppy lovers as compared to DiCanes, as I’ll call 1996’s forbidden lovers. You can tell the Boothfelds attempted to pay meticulous attention to their eyes and the way they looked longingly at each other. But their eyes felt manufactured, and ultimately, Booth was more on the right track than Steinfeld. The DiCanes, on the other hand, had desperate eyes – exactly the way they should. They were desperate to see each other. They were desperate when they were apart. They desperately just loved each other, wanted to be together and were willing to throw everything away to get it. The Boothfelds felt like lust. The DiCanes felt like true, great love. Now back to my screening room filled with teenagers who perhaps had or had not seen any incarnation of this story, Douglas Booth inspired one of the most surprising reactions from a crowd that I’ve seen in quite some time. Literally the first moment his face was revealed on screen, a completely palpable gasp for air was heard and felt throughout the theatre. His boyish good looks actually took their breath away, which left me scanning the room in disbelief that that really happened. It did. Booth even has cheekbones that seem like they could only really be that high if they were die cast on a Barbie doll. He conveys just enough teenage angst to give teens something to relate to on an everyday scale. Booth even takes a page from Taylor “Twilight” Lautner and makes sure to show the ladies his bare boyish chest with 17 pubescent hairs. 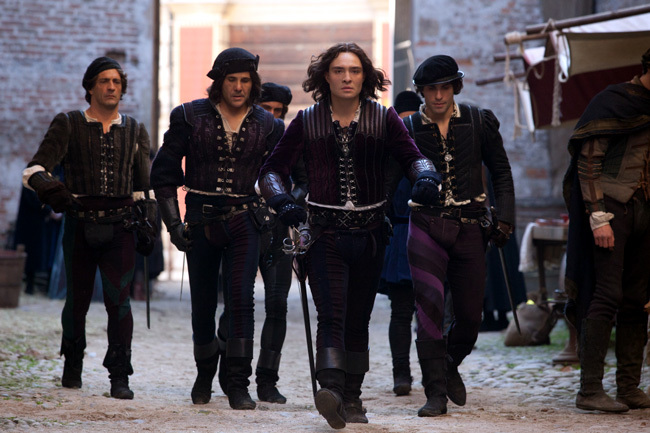 Ed Westwick (center) stars as Tybalt in “Romeo and Juliet”. I’m not sure when in life I became an old-timer, but apparently I have. For this old-timer, 2013’s “Romeo and Juliet” from Italian director Carlo Carlei – who’s done nothing I’ve ever heard of – was nearly completely unnecessary. The Boothfeld chemistry felt like Taco Bell mild sauce versus the DiCanes, who figured out how to exude the heat of the world’s most feared ghost pepper. Now 2013’s version does have Oscar winner Julian Fellowes as one of its writers, who is known for writing TV’s “Downton Abbey”. Fellowes cast Booth in his first film role – 2009’s “From Time to Time” – and therefore salivated for him as Romeo this time around. Fellowes has even been quoted as saying that Booth is “one of the best-looking human beings I have ever seen in my life”. While Fellowes helped give the new film its relatively authentic period-piece feel, clearly resurrecting the story now after 17 years of last being in theatres is to try to capitalize on those four teenage girls – i.e. the diehard “Twilight” crowd. But this version of one of the greatest and “most dangerous” love stories ever told won’t inspire a new generation of Shakespeare lovers. Instead, for those among the younger generation, they’ll experience the fleeting feeling of a spark that burns momentarily and snuffs out quickly thereafter. Paul Giamatti (right) stars in “Romeo and Juliet”. Even the power of Joss Whedon (“The Avengers”) couldn’t prove enough to strike box-office gold in 2013 with Shakespeare’s comedy “Much Ado About Nothing,” which has only earned about $5 million worldwide. “Romeo + Juliet” in 1996 with the DiCanes, by the way, ended in a global gold rush of nearly $148 million. This year’s film, which is only the second from the new production company Swarovski Entertainment – yes, like the crystals – won’t end up even in the same league. Now for those of us who don’t live life as a Twihard but still appreciate Shakespeare’s invention of the “star-crossed lover,” 2013’s version will go down in history as a failure overall with just one success: Paul Giamatti. He plays Romeo’s friend and the famous Shakespearean character Friar Lawrence (played in 1996’s “Romeo + Juliet” by Pete Postlethwaite from “The Usual Suspects”). Giamatti plays the good friar with captivating concern for the out-of-control lover and reckless disregard for what’s sound because Romeo is so starstruck. He’s the only one in the film who doesn’t feel like he’s acting – or overacting – and the casting process should have started with and been built around him. Unless you haven’t ever seen this story or you just want to bask in the splendor that is the Paul Giamatti show, your memory of any previous tale of woe from Juliet and her Romeo is more than sufficient. “Romeo and Juliet” stars Hailee Steinfeld, Douglas Booth, Paul Giamatti, Damian Lewis, Stellan Skarsgård, Kodi Smit-McPhee, Laura Morante, Tomas Arana, Natascha McElhone, Tom Wisdom, Christian Cooke, Ed Westwick and Anton Alexander from director Carlo Carlei and writer Julian Fellowes based on the play by William Shakespeare. The film, which has a running time of 118 minutes and is rated “PG-13” for some violence and thematic elements, opened on Oct. 11, 2013.